This entry was posted in Community and tagged College of Agriculture on July 29, 2014 by Wire Eagle. AUBURN UNIVERSITY — Near the hustle and bustle of a university campus, eight rows of produce grow unnoticed for the sole purpose of feeding the residents of the community. The Food Bank Garden, a short drive from the center of Auburn University’s campus, is a garden flourishing with vegetables, all to be donated to the Food Bank of East Alabama. This spring and summer is the first time in some years that the garden is back in operation, helping those in Lee County and surrounding counties. After a brief hiatus due to a lack of volunteers needed to operate the garden, Guertal and Zach Ogles, an Auburn PhD student in Crop Soils and Environmental Science, revived the garden this spring. This summer, more than 1,000 pounds of produce have been donated, Ogles said. Guertal says Ogles has been the main operator of the garden. 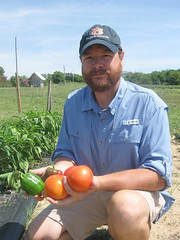 He picks the overwhelming amount of produce every day or two, makes sure the garden is being watered on a regular schedule through the timed irrigation system and that it is being fertilized by the fertilizer injection system installed in the garden. “The garden is able to operate from grants and donations Dr. Guertal has received for the garden,” Ogles said. This summer, about 500 tomato plants have been planted, and produce including cucumbers, bell peppers, green beans, squash, zucchini, okra and cantaloupes is growing in the garden. At the end of the summer, Ogles will replant the garden with cool-weather produce such as broccoli, cauliflower and collard greens. After each harvest of the garden, the produce is taken directly to either the Food Bank of East Alabama or to the Community Market in Opelika, an extension of the food bank, with no middle-man involved. The most important thing about the garden is that every piece of produce gets donated to the food bank, Ogles said. This 14,375-square-foot garden is always in need of volunteers, whether it is picking the produce for the food bank or delivering produce directly to the food bank. “Volunteers would also be a great help in making sure we get as much produce as we can to the food bank,” Ogles said. To learn more about the garden and to get involved, email Guertal at guertea@auburn.edu.